It is yet another friday and time for a new sketch challenge at Stuck On U Sketches!! I have used quite a lot of scraps to make this layout of Konstanse and her friend. The sketch is really perfect for that. This means that I have really no idea which papers I have used. Only thing I know is that the owl is cut from a paper stack I have had for ages from Panduro. 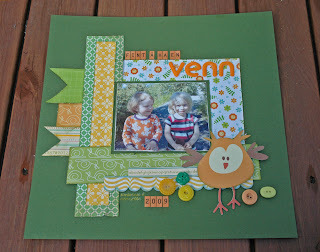 Love the green and orange color palette... and the scraps are totally perfect for this particular sketch! I love getting to use up some of my every growing stash! The owl is just adorable! Really fun layout! Adorable, Stine! Looks like you had lots of fun creating this master piece! Stine, this is too cute!!!! Love the green colors and the sweet little owl!! Hugs!! Winner of my blog hop blog candy! !